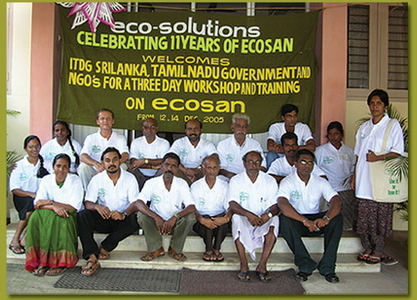 A three day workshop on ecosan was conducted for representatives from ITDG Srilanka, Tamilnadu Government and NGO's from 12-14 Dec, 2005. The participants were given in-depth classes on ecosan and on-site building experience. eco-solutions train social scientists, engineers, masons, NGO's, managers, Government etc. on the practice and theory of eco-sanitation. enquire for details of trainings. © 2006 - 2015 eco-solutions All rights reserved.